The largest Concentrating Photovoltaic (CPV) Solar Power Station in Australia has already reached practical completion, with 40 CPV ‘Dense Array’ dish systems now fully commissioned and feeding clean renewable energy into the national electricity grid. Silex Systems Ltd. announced via a media release on Monday that its wholly owned subsidiary Solar Systems Pty. Ltd. has completed the facility at Mildura, which signifies a major step toward the commercialization of Solar Systems’ unique ‘Dense Array’ CPV technology. “We are excited about the economic potential that this unique technology can deliver to Solar Systems and ultimately to Silex shareholders, “ says Silex CEO Dr. Michael Goldsworthy. 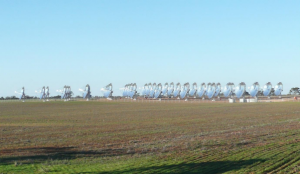 According to Silex the 1.5 megawatt (MW) Demonstration Facility in Northwest Victoria is now fully grid-connected and generates electricity that could power up to 500 medium-sized homes. A commercialization strategy for the ‘Dense Array’ CPV technology is already underway, including reaching operational status for the Mildura and Nofa demonstration facilities. The two sites aim to validate the performance efficiency, energy yields and reliability of the technology over the next 12 months. The company also hopes to secure major project opportunities within Australia and abroad. Pre-feasibility studies of prospective sites in Queensland are already underway, while key off-shore markets such as Saudi Arabia and the US are being explored. The grand opening of the Mildura facility is slated for July 17 and will be attended by Victorian Energy and Resources Minister, The Hon. Nicholas Kotsiras MP. The 1.5MW plant received a financial assistance of $10 million from the Victorian State Government, plus additional support from the Federal Government. Planning for the second stage of the project is already in motion, with the construction of a utility-scale 100MW facility expected to begin in late 2014. Silex Systems Limited is a world leader in research, development and commercialisation of leading edge technologies in key strategic markets, including nuclear power, solar power, semiconductor materials and instrumentation. Silex acquired Melbourne-based Solar Systems which designs and manufactures ultra-high efficiency concentrating photovoltaic (CPV) power generation systems, which are ideally suited to large utility-scale deployment globally.